Combined analysis of the seismic and bathymetric data collected along the Aleutian arch of Alaska near Chirikof Island shows a splay fault beneath a subducted ridge producing a steep and rough seafloor. These structural features suggest the possibility of a earthquake causing a large tsunami that could be directed toward the west coast of the contiguous United States. Significantly, the GPS data from Chirikof Island shows that the fault is 90% locked, strengthening the elastic strain to a critical level where failure in a large earthquake is possible. The Pacific Plate subducts beneath the North American Plate along the Aleutian trench of Alaska. The collision generates an arc of active volcanoes, small to large earthquakes and on occasion small to large tsunamis. In 1946 and 1964, large tsunamis were generated from magnitude > 8 earthquakes near Unimak Island. The Semidi geologic segment lies between these great earthquakes and the last time an event on this segment generated a large tsunami was in 1788. The Semidi segment has a geometry that is capable of generating a transoceanic tsunami that could be directed toward the west coast of the contiguous United States. Legacy seismic and bathymetric data have been improved and analyzed to determine the structure and state of stress along the Semidi segment. The legacy seismic data from the 1970s and 1980s was reprocessed to obtain a more detailed structural image of the segment. Bathymetric data has been collected in multiple patches for several decades and is combined here for a sharper image of the seafloor morphology. Combining the seismic and bathymetric data reveals a subducted seafloor ridge and a splay fault above the ridge. 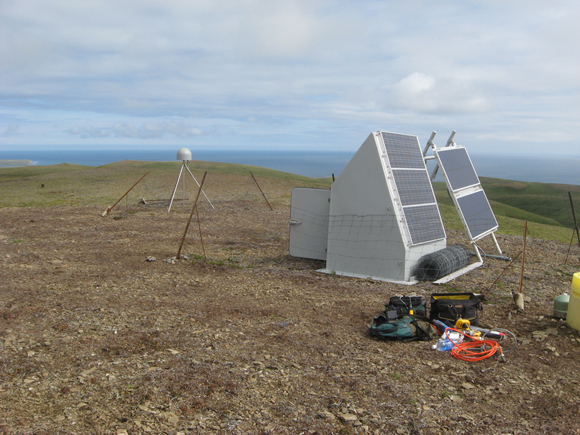 These structures would suggest a more likely possibility of generating a large tsunami along the Semidi segment. The morphology of the Semidi seafloor boundary wedge is rough and elevated, which would support the formation of a tsunami. Most critically, the closest GPS site at Chirikof Island, along the continental shelf edge, shows that the fault is 90% locked and thus the elastic strain may be reaching a level where failure is likely. An earthquake along the Semidi segment could generate a large tsunami directed toward the west coast of the contiguous United States. 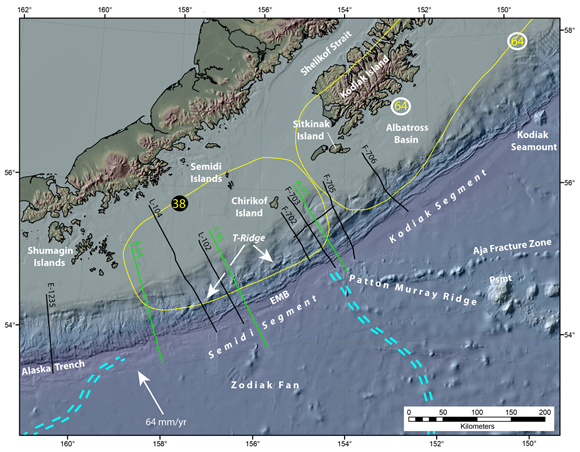 von Huene, R., J. J. Miller, and P. Dartnell (2015), A possible transoceanic tsunami directed toward the U.S. west coast from the Semidi segment, Alaska convergent margin, Geochem. Geophys. Geosyst., 16, doi:10.1002/2015GC006147.